An Educated Parent Voice is a Stronger Parent Voice. Earlier this week, I commented on the education reform movement’s brilliant use of language. This week, another component of their modus operandi revealed itself. Over the years, I’ve noticed that the education reform crowd seems to have incredibly thin skin. If they feel even slightly questioned, they are quick to jump on the defensive. One of their favorite tools to use for their defense is the newspaper editorial. Last week, a lot of folks had questions about Nashville Rise’s true mission and exactly who was footing the bill for their operations. So of course, it was time for an editorial, and Nashville Rise co-founder Wendy Tucker did not disappoint. In this editorial, there are a few interesting nuggets. First of all, Ms. Tucker reiterates that Nashville Rise is “a parent-led, grassroots coalition of district, charter, magnet, and private school parents from across Davidson County who have joined forces to advocate for high-quality education for every child” and who “generally tune out negativity and focus on our work. When the integrity of our parent volunteers is maligned, however, we feel compelled to respond.” See what she did there? Very subtly and delicately, she shifted the conversation from questioning Nashville Rise and its intentions to defending parents who were supposedly being maligned. Before we go any further here, let’s get one thing perfectly clear. Nobody is questioning the integrity or the validity of any of the parents who are involved in Nashville Rise. I’ve always said the more voices in the conversation the better, and everybody is welcome to their own opinions as long as they can defend them with empirical evidence. Point being, if you are advocating for educational policy that impacts more than just your child, you need to be able to defend it and site the sources for your opinions. I don’t think that’s too much to ask. Which leads us to a question I’ve asked a couple of Nashville Rise supporters this week. What exactly does “parent voice” mean? What does it look like? A clear answer did not emerge, but it seems to me that it should mean more than just allowing parents to speak. It needs to mean more than just hearing what they say, nodding of heads, and then proceeding as planned. In other words, parents need to be empowered to fully advocate, and if that is to happen, then they need to be educated in a cross the board and transparent manner. Any potential bias needs to be clear immediately. That doesn’t mean that any information is deemed instantly invalid, it just allows a parent a greater ability to assess its veracity. Just becoming a parent does not mean that a full understanding of educational practices and an understanding of the public school system will be suddenly downloaded into your brain. There is so much to learn, and it’s vital that parents have resources to go to that give them as neutral an overview as possible. Sources that lay all the facts on the table and allows them to draw conclusions of their own – not my conclusions or charter advocates’ positions or private interest agendas. There is so much to understand about educational practices and policies that adding in the vetting of informational sources makes the job almost impossible. Our children’s teachers are a great starting point, and we need to empower them, but advocacy groups must hold themselves to a high level of transparency as well. In short, the money matters and its trail should be visible. Choice advocates like to say nobody knows a child like their parents do. Well, I hate to break this to you, but nobody knows one side of their child like parents do. Children are multi-dimensional and will show different aspects of themselves to others depending on whose company they are in. In my children’s very short education career, I’ve already had teachers give me insight into sides and traits of my children I was unaware of. Just one more reason why we need to establish strong partnerships with our children’s teachers. They see them in situations that may never be visible to us as parents. We as parents are also not without bias when it comes to addressing our children’s strengths and weaknesses. As the exercise commenced, it quickly became apparent that this was indeed the group Peter belonged in. I think he subtly took notice of what group he was in and therefore worked harder to prove himself. The teacher knew this because he worked with Peter on a regular basis and was able to evaluate in a less biased manner. By being in the group he was placed in, Peter was also able to push the other kids who needed the experience of going against someone with his skills. The drill unfolded in a manner that was beneficial to all students and not just my child. Seems my parent voice needed a little educating. Let’s get real clear again. Having a parent advocacy group financed by Michael Bloomberg is like having an AA group funded by Anheuser-Busch. They may provide a vehicle for getting sober, but just sober enough that you can begin using their product. How clear a picture of the dangers of alcohol do you think you would get, or do you think an underlying picture of moderation would be advanced? Do you think somehow the many charitable contributions Anheuser-Busch makes wouldn’t get introduced into the conversation? The exact same premise holds true for Nashville Rise and their bigger group, Project Renaissance, and their funding sources. Bloomberg Philanthropies basically brags about buying school board elections on their website. To quote from said website, “Bloomberg supports pro-reform candidates regardless of their political party, and seeks opportunities to support those whose vote or engagement would make a real difference in state and local policy.” Hmmm… seems to me that their interest is more involved than just having parents speak up. It seems that they have very specific things they’d like those parents to say. Take this information and couple it with Project Renaissance founder Karl Dean’s history as mayor of Nashville, and a very interesting picture starts to emerge. Dean and Tucker continually beat the drum that this is not about charter schools, yet it always comes back to charters. This week, Nashville is hosting a national charter convention. Who is the state sponsor of this conference? None other than Project Renaissance. Of course Ms. Tucker didn’t mention this in her editorial. My grandmother used to say, “If it walks like a duck, talks like a duck, looks like a duck,…odds are it’s a duck.” Yet Project Renaissance continually wants us to believe it’s a horse. Karl Dean had his eight years as mayor of Nashville. He had ample opportunity to enact policies that would increase the successes of Nashville’s children. Where we are now is as much on him as anybody, good and bad. But his time is done and for some reason he fails to heed the unwritten “one mayor at a time” rule by founding an organization that may directly counter the initiatives of the current mayor. The only explanation has to be that he is using Project Renaissance as a vehicle to push his own ambitions of running for a higher political office. He needs to be reminded of a truism that he seems to have forgotten during his time in office, children and their education should not be used for the political needs of adults. Despite no longer being mayor, Karl Dean continues to try and influence parents about schools that his children have never, nor would ever set foot in at a time when Nashville residents have elected a new vision. Maybe he’s just trying to support the status quo. Supporters of Nashville Rise have been trying to paint Project Renaissance and Nashville Rise as two separate organizations. To counter that argument, all you have to do is go to the Project Renaissance website. Read through all the platitudes, and then go down and hit the “Get Involved” button. Amazingly, you are transported to an application for Nashville Rise. I encourage you to read through their whole website. You’ll see plenty of invites for advocacy and parent voice. You’ll also see they have a very specific plan and very specific goals. So what happens if a group of parents voice a difference of opinion? I’m sure that either they will be properly educated or politely shown the door. 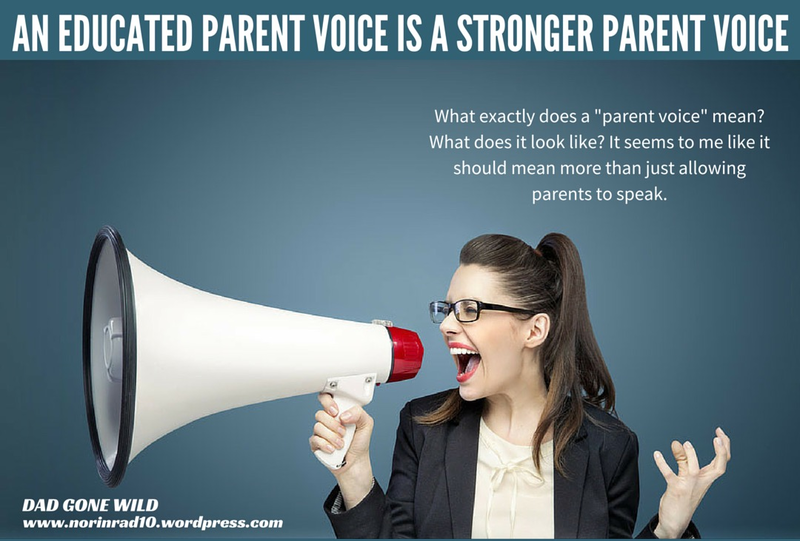 Parent voice will take on a different definition. This is why current school board members Will Pinkston, Amy Frogge, and Jill Speering declined Nashville Rise’s invitation to participate in their recent forum. Their participation would only lend credibility to an organization that espouses fidelity to parent voice yet fails to practice the transparency required to strengthen that voice. If they were to have participated, they would have only given amplification to an organization that is more about a private agenda and less about making sure all parents’ voices are heard. If you don’t believe that Pinkston, Frogge, and Speering are listening to parents to begin with, then I urge you to pick up the phone and call them. You might be surprised. Based on what I saw upon attending the forum, I’d say the 3 sitting schoolboard members made the right choice. There were parents in attendance but most attendees seemed to share a common focus. Some sympathizers claim an attendance of 400. Moments after the event started I did a quick head count and got a figure of 200. I doubt the number doubled by the end, so I’d say 250 is probably the most accurate number. The telling count though came when the moderator, Tennessean editor David Plaza, announced the elected officials in the house. There was one running for office, one former office holder, one sitting school board member, and the spouse of a candidate. I would take that as an indication that Pinkston, Frogge, and Speering weren’t the only ones with doubts. Villains do not show up at our doors twirling handle bar mustaches with tusseled up girls tossed over their shoulders preparing to tie them to the railroad track. They come in speaking a language that uses our fears and loves in order to further their own ambitions and agendas. They say things that will make us trust them and believe that their goals are our goals. In the age of social media and its constant bombardment of images, articles, and advertisments, communication has gotten a lot more sophisticated, and unfortunately, that means we must constantly stay vigilant. We also need to remember that those with different views are not automatically villains. It makes it imperative that we don’t allow those with outside agendas to manipulate us into becoming adversaries. Don’t let them tell you I’m trying to discount “parent voice”, in fact, it’s quite the opposite. A recent article in the Atlantic Magazine asks if our education system is actually truly broken. After careful analysis what they found was that is has actually been making steady progress over the last 40 years. Teachers are better trained. Minority students are making greater gains. Curriculum is more focused. Yet this myth of massive decline has somehow become truth. Truth that leads, as the article points out to a greater tolerance of half-baked schemes. The way to guard against such schemes is to become better educated and separate the myth from fact. To quote “History may reveal broken promises around racial and economic justice. But it does not support the story of a broken education system.” We need to keep that in mind going forth and focus on repairing the broken promises so that we can strengthen the unbroken system. This Rise group is like the Lift group in memphis…. Claiming to be grassroots and parent-led, generously funded by secretive private interests, their goal is charters (even if it means failing ASD charters), etc. Rise… Lift… They are both full of hot air, and both focused on seeing their own bank accounts rise/lift. Memphis Lift even pays parents to advocate door-to-door. Memphis Lift also pays a PR firm in Nashville. And Lift recently advertised for a full-time Finance Director job to handle their organization’s money. Grassroots? Parent-led? Only the gullible would fall for it. Unfortunately, there are many gullible, greedy people in the world.